DALLAS–When it comes to educating stakeholders about the potential environmental impacts of upstream oil and gas operations, it’s difficult to overstate the value of the personal touch–applied early and often. That value increases exponentially when it focuses on a common industry activity that environmental pressure groups have turned into a lightning rod for controversy: hydraulic fracturing. Despite its long history of more than 2 million successful applications without environmental damage, hydraulic fracturing is in the cross hairs of both large, well-funded pressure groups and local activists. Despite its essential role in U.S. oil and gas production–according to Halliburton, 60-80 percent of all wells drilled in the coming decade will require fracturing to be economically viable–dramatic and even histrionic opposition to fracturing has spawned many regulatory, legislative and litigious initiatives to curb or even ban the practice. It isn’t too much of a stretch to say that even the viability of America’s oil and gas industry could be at stake, if industry cannot successfully mitigate the public’s concerns over this essential activity. Public service announcements, educational brochures and microsites, television and radio debates, etc., are all well and good, and I believe industry executives are obliged to do their part to defend and promote the industry’s good environmental stewardship. But we absolutely must recognize that one of industry’s top priorities is to have an established, proactive community relations outreach policy in place as part of its project planning, especially when it involves a practice suddenly deemed controversial. In effect, an oil and gas operator has one license to operate from regulatory agencies, and another “license” from the affected community. An operator cannot have one without the other these days. It is critical to engage–and to engage early–at the local level. At Breitling Energy Companies, we have had such a policy and stakeholder engagement philosophy for some years, and it has served us well. 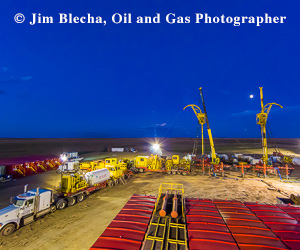 The balance of this commentary will relate one case study that outlines the steps we took to engage stakeholders regarding plans for drilling and fracturing a pair of horizontal Granite Wash wells in the Texas Panhandle. Our success with this outreach effort has enabled it to serve as a template for our stakeholder engagement philosophy. Breitling Oil & Gas, along with operator, Devon Energy Corp., fractures the Buffalo Run No. 1H horizontal well in the Buffalo Wallow Field in Hemphill County, Tx. Breitling was able to relieve local citizens’ concerns regarding water usage and quality through direct and early engagement on a personal level. The Buffalo Run project involved drilling and fracturing the Breitling Buffalo Run No. 1H and No. 2H horizontal wells in partnership with operator, Devon Energy Corp. The wells targeted low-permeability Cherokee Granite Wash sections A through G in the Buffalo Wallow Field in Hemphill County, Tx. The project had been in planning for six months, but we were aware there might be some local concerns, mainly regarding water availability and quality. This was at the beginning of a severe drought in 2011, and it was hitting hard in this largely rural area, where a substantial number of retirees were focused on agriculture. Because this was Texas, of course, some in the community had some familiarity with oil and gas. Some owned mineral rights; some did not. Many already had made up their minds on hydraulic fracturing. We had been talking at Breitling about town hall meetings since I took part in such encounters in early 2011 in Warsaw, Poland, at the outset of drilling the first shale gas well in that country. I thought they would do well in America, and believed we could engage people at a local level and secure their buy-in before any controversy that might emerge could spiral out of control. It’s also important to note here the tenor of the time: The big backlash against the upstream oil and gas industry over hydraulic fracturing was building in the wake of a highly inflammatory (and wildly inaccurate) documentary film and celebrity activism garnering headlines. But industry representatives seemed to be digging in their heels and focusing on defensive postures, either being dismissive of those negative claims simply by touting a track record no one outside of industry was familiar with, or by claiming proprietary privileges. I felt it was time to stop patting ourselves on the back for that good track record and to stop claiming “trade secrets” as a defense. It was time to be proactive, not reactive, and to get in front of the people who mattered the most: the citizens of the towns near where we were drilling. It was the start of Breitling Energy Companies’ “social license initiative” to get community buy-in wherever we drilled. To implement its social license initiative, Breitling didn’t enlist marketing or public relations agencies, nor employ crisis management consultants. There was no big media campaign. What Breitling undertook in its social license initiative was pretty rudimentary. We had our field operations personnel go to local cafes, restaurants and grocery stores, and post fliers informing local citizens of an upcoming town hall meeting, where we would provide details of our project and explain the processes involved and any likely impacts, as well as answer any questions the residents might have for us. A critical aspect of this kind of outreach was that we were able to interact directly with citizenry ahead of any kind of formal affair or press release, thereby indicating we were interested in getting their input and addressing their concerns directly. We knew from this early interaction what some of their concerns were, and that put us in a position to address them intelligently and comprehensively at the town hall. How the local economy benefited from the project. We then fielded questions from residents, who were concerned mostly about water acquisition and, more importantly, what chemicals were going to be injected into the subsurface. We were proud to point out that our EnviroFrac process called for eliminating any additive not essential to the successful completion of the well, and also determined whether more environmentally benign alternatives were available for any essential additive. As founder, president and chief executive officer of Breitling, I felt it was important for me to lead the company’s stakeholder engagement personally, and to respond to each of the audience’s questions directly and thoroughly. While I maintain a fairly high profile on energy and environmental issues in the public arena, this experience was the exact opposite: low-profile, low-key, and almost one-on-one. Was it effective? Absolutely. The town hall meeting got the word out, and local citizens who did not attend subsequently came to the drill site with their questions. It got the conversation started. We now undertake these town hall meetings at each area in which we drill. The upshot was that both the Breitling-Buffalo Run Nos. 1H and 2H wells were drilled and completed without conflict or drama, and our expectations for test results were exceeded. Local stakeholders have a vital role to play–it seldom is too early to engage. Oil and gas companies must make every effort to assure all stakeholders, especially the local community, that safe, environmentally sound development and conservation of oil and gas resources benefits us all. It is essential for an operator to define and address clearly any potential negatives before his opponents do. Our results validate that the personal touch, applied early, can be the difference in making or breaking a project. Chris Faulkner is the founder, president and chief executive officer of Breitling Energy Companies, based in Dallas. His background in the oil and gas industry has been focused on North America, Europe and the Middle East, and has involved project and facilities management, drilling and production, and business development. Faulkner studied biomedical engineering at Southern Methodist University, and business and mathematics at Baylor University and the University of North Texas, and he holds an honorary doctorate in business administration from Concordia College.